The core network leads the way because it is so essential for all transactions. Cloudifying the core is a major goal. Following in Three UK’s footsteps, on their deployment of the world’s first fully integrated cloud native core network, many operators are making their core networks cloud-native, with open APIs to encourage service creation. A converged core on the Cloud for fixed, mobile and web-scale enterprises is one of the preparations for the new age. But what will a real cloud-native core look like? What are its essential components and how do we get there from here? Shared Data Layer As well as being a common store for all user and service data, the Shared Data Layer also acts as an open repository allowing third parties to develop new services and contribute new revenue streams. Stateless VNF machines These are another key element, offering a radically simplified architecture and simplified operations with plug-and-play installation and a high degree of resilience. Openness In the new world of the Cloud, openness is one of the defining characteristics. AirGile offers a programmable open ecosystem, allowing OTT services, open APIs and a modular open architecture. Micro service architecture AirGile also supports a micro service architecture with small components that allow services to be adapted, developed, scaled up and managed much more quickly and readily. Distributed and centralized core deployment A cloud-native architecture allows both distributed and centralized core deployment bringing huge benefits – 10 Gbps peak rates, 1 ms latency and 1000x traffic growth. Web scale deployment This is the final piece of the puzzle as it offers automated life cycle management for software defined VNFs. Hardware and cloud infrastructure agnostic, it supports network slicing. Customer and analyst feedback since the launch has been particularly strong, ie. “the fact that the full raft of Nokia core network VNFs are available on a publically accessible cloud platform provides further endorsement of their cloud-native credentials”. To clarify, the software running these Cloud elements is produced on a DevOps model of continual development and deployment. Because it has rapid feedback from the field, it offers ten times fewer failures, a tenfold shortening of time to market and a tenfold increase in operational efficiency. Cloud-native characteristics are a key enabler for transforming the core network, while DevOps, automation, programmability and analytics are the drivers to encourage operators to transform their businesses. To support the move to a true Cloud architecture, AirGile cloud-native core is being continuously evolved towards 5G architecture. 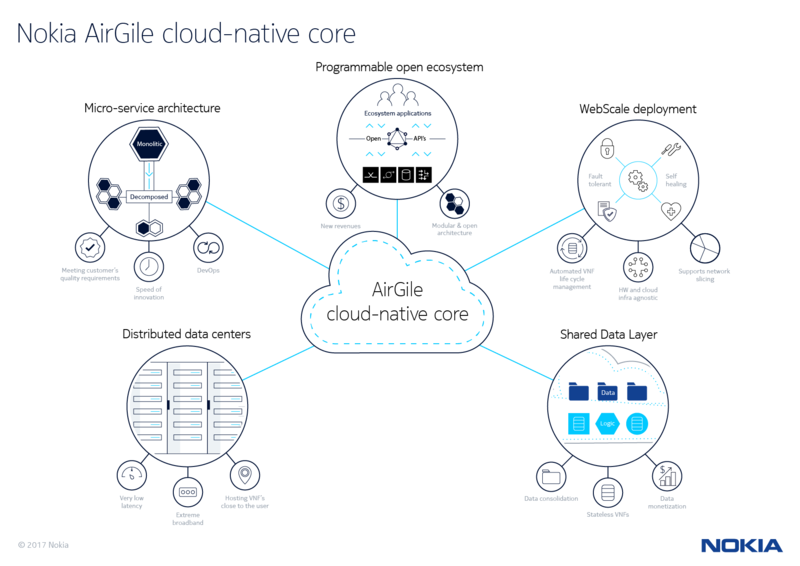 Nokia is on the road to a true cloud-native core and AirGile is our road map. There’s more to come – so stay tuned, and visit us at Nokia booth at Mobile World Congress 2018 to see the latest innovations on AirGile cloud-native core and DevOps. In the meantime, here’s a very helpful webinar about the cloud-native core network by Nokia and Heavy Reading analyst Gabriel Brown .